Making a man bag in the image of an incredibly popular women’s handbag just makes sense. Most men who are in the market for a bag that costs four figures also have at least a passing awareness of women’s fashion, and I’ve heard lots of fashion-interested male friends lament that they’d love to have larger, less purse-sized versions of handbags from the Givenchy Antigona to the Hermes Birkin. Some of those bags, like the Birkin and the PS1, do come in larger, basically unisex versions that appeal to men who are sensitive to the stigma of a “purse,” but other brands choose to give dudes a slightly tweaked version all their own. Both the Yves Saint Laurent Leather Holdall, a version of the ever-popular Yves Saint Laurent Cabas ChYc, and the Mulberry Piccadilly Holdall, which is a Mulberry Bayswater if I’ve ever seen one, stick to the idea that men are more than willing to buy womens’ bags if you butch ’em up juuuuust a little bit. That makes sense, of course – women’s bags are a huge revenue source for fashion brands, so a lot of work time is put into designing and perfecting them. When a style becomes a runaway hit, it only makes sense to build on that for a wider audience, including men. Generally bags are adapted for men by making them larger and tweaking the proportions a bit, and in the case of the Cabas ChYc, its hardware was changed from gold to a more industrial-looking silver. The Y logo was also decreased in size, relative to the proportion of the bag. The Mulberry bag, on the other hand, was mostly made larger and wider to distinguish it from the more ladylike Bayswater. It should go without saying, of course, that black leather is the preferred material for such designs. So what do you guys think of these bags? Dudes, would you ever carry a modified man bag like this? 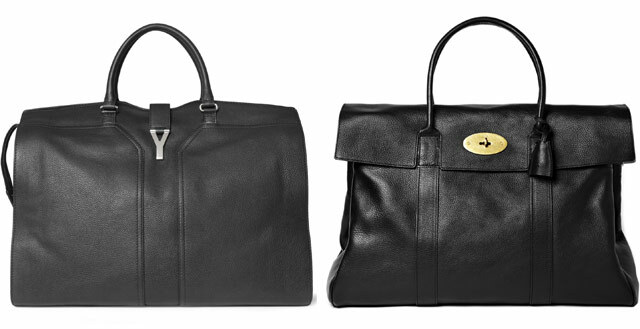 The YSL version sells for $2395 via Mr. Porter, while the Mulberry bag will set you back $1850 via Mr. Porter.